The Vatican has sought to "clarify" remarks made by a senior cardinal, who linked homosexuality with paedophilia in the abuse scandal facing the Church. A spokesman provided "data" to support the claim, but also said Church leaders were not trying to make assertions of a "psychological or medical nature". 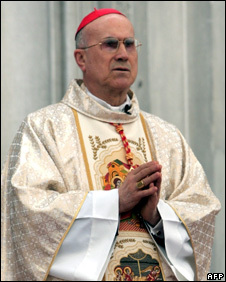 Cardinal Tarcisio Bertone said it was homosexuality - not clerical celibacy - which lay behind the abuse of children. Earlier, France condemned the cardinal for making "an unacceptable linkage". Earlier this month, Pope Benedict's personal preacher apologised for having compared criticism of the Roman Catholic Church over abuse allegations to "the collective violence suffered by the Jews". In a sermon, Father Raniero Cantalamessa likened allegations that the Vatican had systematically hushed up cases of sexual abuse of children by priests to the "most shameful aspects of anti-Semitism", with the use of stereotypes and the spreading of collective guilt. The Vatican said his remarks did not represent its official view. Cardinal Bertone, the Vatican's secretary of state, was attempting to defuse the scandals currently afflicting the Church during a visit to Chile on Monday, when he denied that celibacy was to blame. "Many psychologists, many psychiatrists have demonstrated that there is no relationship between celibacy and paedophilia but many others have demonstrated, I was told recently, that there is a relationship between homosexuality and paedophilia," he said. On Tuesday, Vatican spokesman Father Federico Lombardi insisted the cardinal had not been making an assertion, but also detailed its "statistical data" on the abuse of minors by priests. "Church authorities do not consider it their responsibility to make general statements of a specifically physiological or medical character, which is why they naturally refer back to experts' study and ongoing research on the subject," he said. According to the satistical data collected by the Congregation for the Doctrine the Faith, "about 10% of cases were paedophilia in the strict sense, while 90% were cases of ephebophilia [the sexual attraction in adults to adolescents]", he added. Fr Lombardi told the AFP news agency that the statement was aimed at "clarifying" Cardinal Bertone's remarks and should not be seen as the Holy See "distancing" itself from them. Earlier, France - where an estimated 60% of the population are Catholic - became the first country to criticise the cardinal. "This is an unacceptable linkage and we condemn this," foreign ministry spokesman Bernard Valero told reporters in Paris. "France is firmly engaged in the struggle against discrimination and prejudice linked to sexual orientation and gender identity." In Italy, gay rights activist Aurelio Mancuso accused the cardinal of "clumsily trying to shift attention to homosexuality and away from the focus on new crimes against children that emerge every day". Commentators in the Italian press also criticised the remarks. In Corriere della Sera, Piero Ostellino said the Pope should be "protected" from the "imprudent remarks of some high prelates", while La Repubblica's Francesco Merlo said the "Church is hurting itself, not homosexuals". The attempt to link homosexuality with paedophilia was a "dramatic confession of weakness [betraying] the confused state in which the Catholic Church now finds itself," Mr Merlo added.